SharpEye is an optical music recognition program which has an interactive graphical environment for editing the symbolic music notation extracted from scanned music. Start SharpEye in the Lab by clicking on the taskbar icon which looks like a cyan/black wholenote with a sharp in front of it ( ) in windows, or type "sharpeye" in the terminal in OS X. Music can be scanned directly from SharpEye using the "Aquire" option in the File menu, or you can scan with a separate program and choose "Open Image" option in the File menu to load the graphic music. When processing several pages of music, it is more efficient to first scan with the Epson GT-15000 Scanner in the lab, and then process the scanned images in batch mode within SharpEye. SharpEye windows with an example scan and conversion to symbolic data. After you have loaded the scanned image into the bottom window of SharpEye, press on the music recognition button which is the icon with a right-pointing arrow on it. In a few seconds, music should be displayed in the top window which can be played or edited. There are lots of editing features, but for the simple example there will not be much to fix, so don't worry about these features yet. Save the recognized symbolic music data to the MusicXML format by going to the menu "File→MusicXML→Save As..."
Click on the "Add files..." button and select the pages that you want to include in the recognition process. (Shift click for a range of pages). Choose the output folder. In the example image it is set to "D:\Craig". I would recommend that you check the option "Join files after conversion" and specify a filename to save all of the converted pages' data into a single file (called newpiece.mro in the above example). 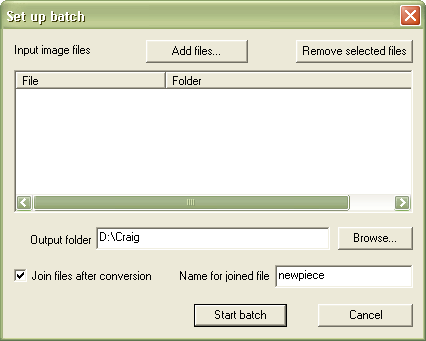 The batch process will create a separate .mro file for each page that it processes. After all pages have been processed, it will then combine these separate pages into a single file if that option is checked. (I keep only the joined .mro file and delete the individual .mro pages). After the batch process is finished, go to the menu option "File→Open Music..." to load the combined data file (newpiece.mro in this case). If you do not join the files after conversion, you can edit the separate page .mro files, and optionally join them one page at a time at a later point. A handy tip: Select the menu option "View→Display Image" to view the original scanned image after loading a music file created with batch mode (otherwise, you will only see the symbolic music window and not the scanned image window). Right-click here to download .mro file, or Right-click here to download .xml file saved as output from SharpEye after corrections made to symbolic data. Right-click here to download Finale 2009 .mus file. Press Shft and then click-drag to select multiple notes at one time. Press Ctrl and then click on notes to add them to the selection. If the red-colored menu is being displayed, right click with the mouse to bring up the green-colored menu. While the green-colored menu is displayed, there will be a red cross-hair in the scanned music showing the parallel location to the mouse pointer in the symbolic music (useful for checking for errors). Gray colored slurs are not attached correctly to notes, so they must be fixed by moving one end or the other to attach to notes on both sides. Gray notes represent a rhythmic error in the measure which you will have to fix in some way. There is an option for rhythmic parsing which is important to understand if you want to use SharpEye a lot (read the manual). Keyboard shortcuts for several menu selections are defined: F1 = help, F2 = flip stem direction on note(s), F3 = beam/unbeam notes, F4 = cycle through augmentation dots, F5 = make note(s) 32nds, F6 = 16ths, F7 = 8ths, F8 = quarter note(s), F9 = half note(s), F10 = whole note(s). There is an option to recognize lyrics or not, and if so, what language to use for the recognition. Either choose your own piece of music to scan (one or two pages), or finish cleaning up the data extraction for the two-page exercise on this page. When creating input images for SharpEye, the format must be a black & white or grayscale TIFF images with LZW or no compression (no other file formats, no color TIFF, no other types of compression). An easy way to create the TIFF images is in Adobe Acrobat Pro. You can scan your own paper copy of a piece, or try IMSLP. 1. Save the extracted music using the MusicXML export option in Sharpeye. 2. 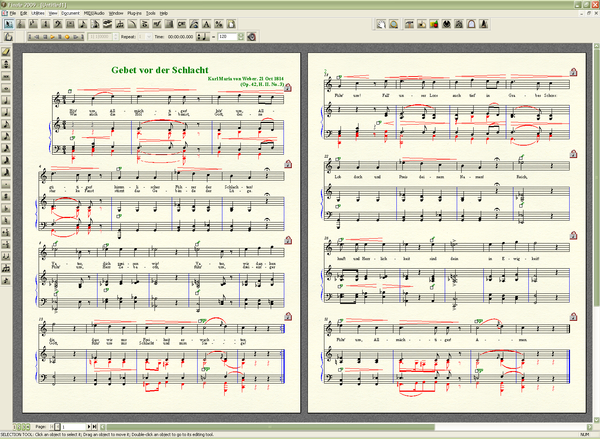 Load the saved MusicXML file into Finale, MuseScore (download and install first: Open-source notation editor) and Noteflight (online notation editor). 4. 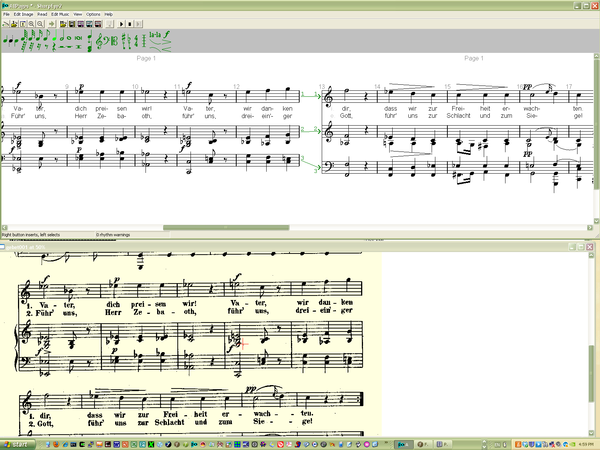 Compare the differences in the notation between the three programs. Are there any differences, similarities, bugs? Email the MusicXML file, the three PDF files and your analysis of them to Craig and cc Eleanor. http://www.visiv.co.uk/about.htm A brief description of SharpEye. http://visiv.co.uk/dload.htm Download free 30-day trial version of SharpEye. http://www.visiv.co.uk/manualv2.pdf SharpEye Manual (in PDF format). http://www.visiv.co.uk/L2SDKdoc.htm Documentation for the Liszt music-OCR engine which runs behind the scene in the SharpEye graphical user interface. http://www.visiv.co.uk/tech-mro.htm Internal data format used in SharpEye. http://gamera.sourceforge.net Gamera: A software framework for the creation of domain-specific recognition applications. 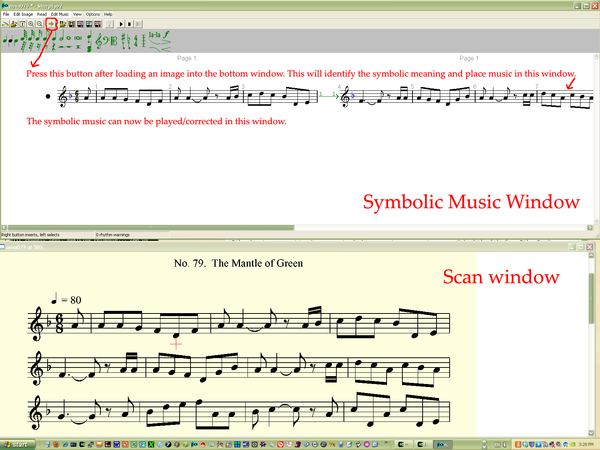 Music OCR being one application.